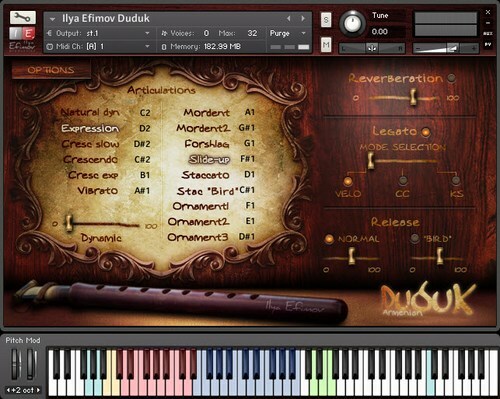 The Duduk is a traditional Armenian woodwind instrument for Kontakt (Native Insruments), originating in the fifth century. The sound of the duduk, if not the instrument itself, has become widely known through its use in popular film soundtracks. Starting with Peter Gabriel's score for Martin Scorsese's “The Last Temptation of Christ”, the duduk's sound has been employed in a variety of genres to depict archaic and mournful moods. 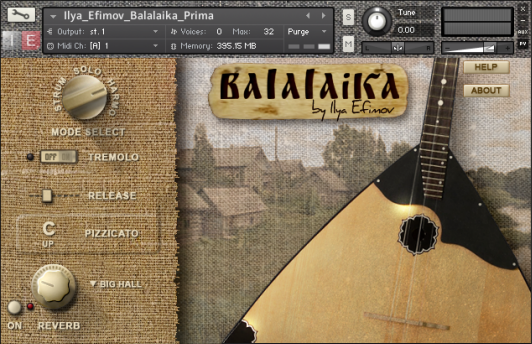 Ilya Efimov Domra - Russian folk instrument known that domra more than 1,000 years, while balalaika only about 350. From the history of the balalaika and domra all musicologists make an unambiguous conclusion: domra and balalaika - two different modifications of the same kind of stringed instrument . Only one of them historically earlier and the other later. In this domra - ancestor balalaika. 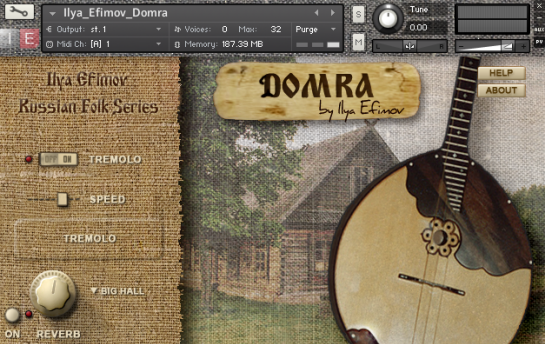 Domra for Native Instrument Kontakt Player. The basic techniques for playing the domra are: pick single strokes (up / down) and tremolo. Other useful and colorful playing techniques include finger pizzicato, harmonics and glissando. 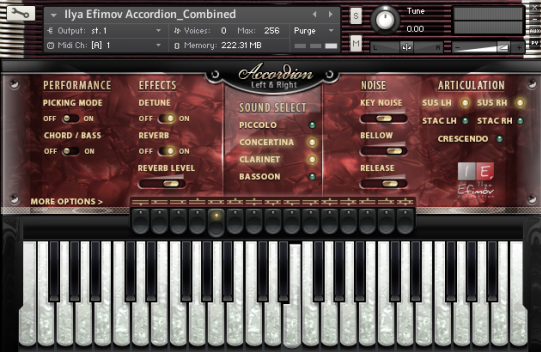 Ilya Efimov Accordion - sound accordion library for sampler Native Instruments KONTAKT. Accordion that can play four tone on the right keyboard (piccolo, accordion, clarinet and bassoon), and two tone controls for bass register. The library allows the player to choose one or combine multiple voice sounds using any of the available 15 registers, as in the present accordion. 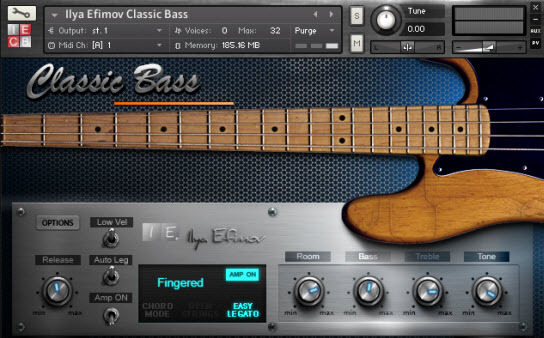 Classic Bass library by legendary russian Ilya Efimov Production is a detailed emulation of a Fender Precision Bass Guitar. Recorded 12 dynamic layers for each fret of each row with different playing techniques and articulations. Recorded in the sound studio 12 dynamic layers for each fret of each line with a variety of playing techniques and articulations. Methods Playing in one patch: fingers, slap, palm - mute and more articulation - allow you to conveniently and quickly edit MIDI recording or playing in real time. We have minimized the use of shift keys, which makes the device easy and intuitive to use. 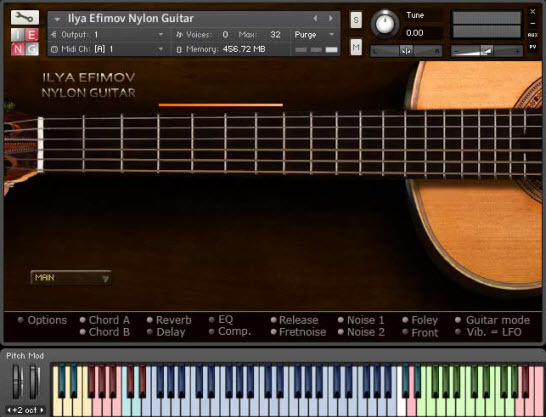 The sound of Ilya Efimov Nylon Guitar is rich and sensual, transparent and incredibly expressive. We have made fantastic realism by using 14 dynamic colors for each note. You can use all frets for each string. The select of the strings and positions can be both automatic and manual. The control over any parameter is available though Graphic User Interface and your sequencer. You can easily use any of 14 articulations, selecting a particular articulation that you need. 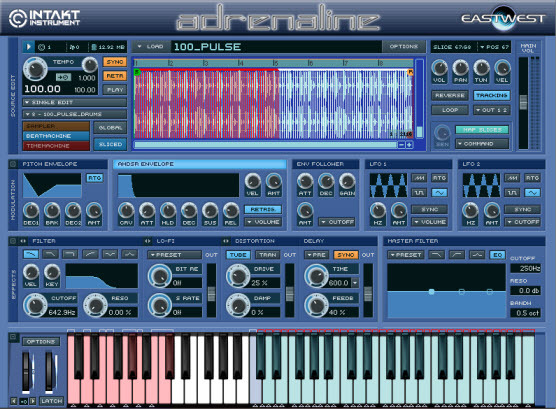 East West Adrenaline Sound Library based on Native Instruments Intakt. East west Adrenaline is a distinctive cross section of all current musical styles with only one common theme - the ability to inject vital energy into anything it touches. Load up one of the presets and you'll see each of the loops mapped out onto individual keys in a construction kit format. Experiment with the "beat Machine" which syncs each multitrack loop to the host sequencer. "Funkify" your percussion loops with sync delay. For that total "other world" dub experience, up the feedback level till it self-oscillates.